SAN FRANCISCO, CA â€“ November 17, 2011 â€“ This week, critically acclaimed comics publisher Top Shelf Productions launched their library with Graphicly, the leading digital entertainment platform. Top Shelf has released award winning comics and graphic novels by creators such as Alan Moore, Eddie Campbell, Jeff Lemire, Jeffrey Brown and many more. 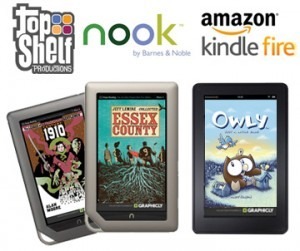 Graphicly has made Top Shelf titles available on the Barnes & Noble Nook platform, the Amazon Kindle Fire as well as through the Graphicly suite of applications. Top Shelf publications are currently available on Graphicly at http://graphicly.com/top-shelf and can be found on Barnes & Noble by searching in the Nook Store and on Amazon by searching in the Kindle App Store.